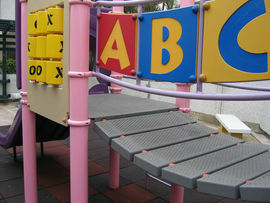 Soft interlocking tiles, usually made of rubber, used as a safe flooring for children's playground areas. Playground tiles are available in different thicknesses, which should be selected according to the fall height of the playground. Rubber tiles, at a cost about $8 to $12 per sq. ft., are the easiest type of solid playground surfacing to repair because it is possible to replace only the damaged tiles rather than replacing the entire surface. Poured-in-place rubber surfacing is also more expensive initially, costing about $11 to $17 per sq. ft.